Is Barack Obama actually not in this photo of Barack Obama? So, yes, this is actually just a picture of Barack Obama's grandparents hanging out in New York, where they did not live and where Obama was attending college, without their grandson, who was I guess secretly in Pakistan, at the time. I think that's what has been definitively proven here. Obama was being a Marxist Muslim in Pakistan. 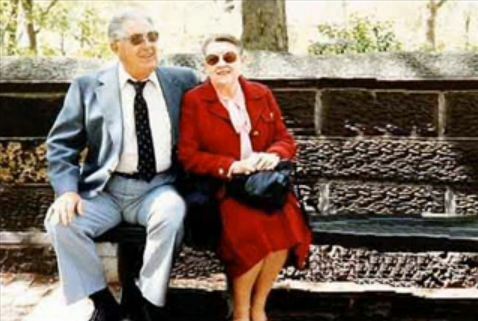 But unmentioned by Cashill is the single most insidious part of this deception: While Barack Obama is nowhere to be found in the unretouched version of this photo, his knee is still in between his grandparents. What was Barack Obama's knee doing in New York, while the rest of him was in Pakistan, and Indonesia? Dealing drugs? Why are mainstream journalists afraid to ask tough questions about the president's detachable knee? The people have a right to know! Cashill was just recently on "Fox & Friends" in order to promote his reporting on the president's mysterious background. His work has also been endorsed by Andrew Breitbart and the National Review's Andrew McCarthy.